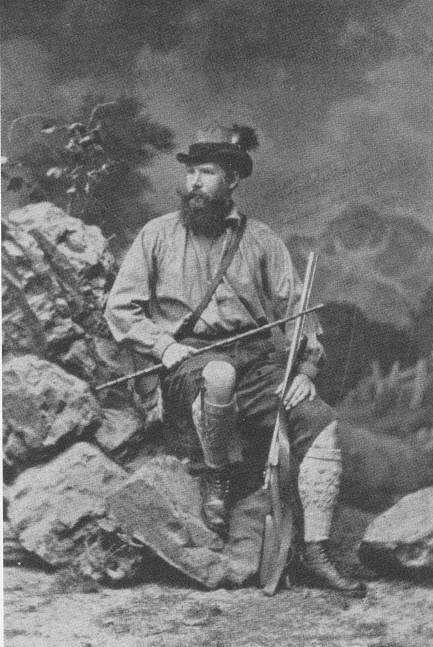 This photo from “Wild und Hund” about 1875 shows Hans Heinrich XI , Fürst (Prince) of Pless with a single shot “Fürst Pless” Stalking Rifle (Pirschbüsch) . The image is courtesy of my friend Axel Eichendorff. I wish to thank my friend Axel Eichendorff of Germany who supplied much of the material that follows and kindly allowed me to use it here. The guns referred to as Fürst Pleß Gewehr were the development of Rudolph Berger in Köthen. In 1859 and 1860 he was granted Prussian Patents for a Breech Loading needlefire action which used straight line coil spring powered strikers. When the needlefire system of ignition was replaced by the center fire the Berger design was adopted to center fire with a few changes. 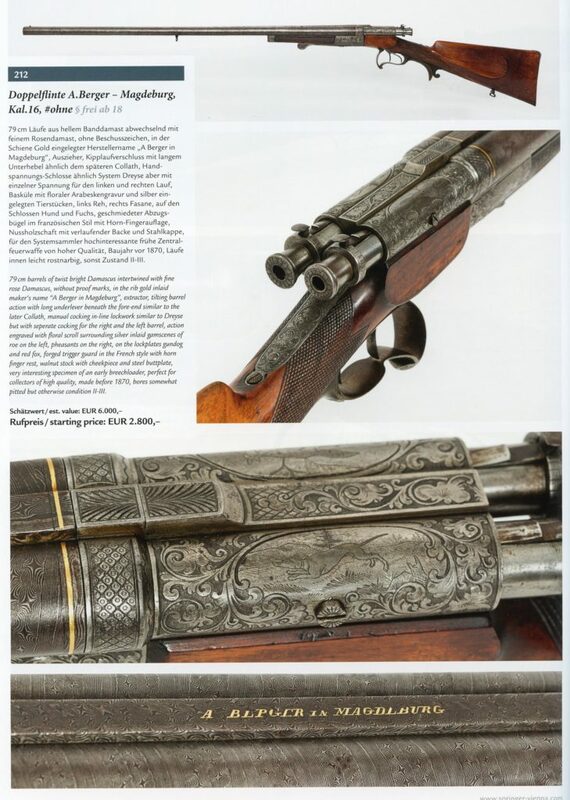 The Berger center fire guns both rifles and shotguns were favored by Fürst (Prince) Hans Heinrich XI, Count von Hochberg, Prince of Pless, Freiherr von Fürstenstein. He was born in Berlin in 1833 and passed away in 1907. Between 1872 and 1891 he was the Prussian Court Jägermeister and was held in high esteem by both Kaiser Wilhelm of Germany and Emperor Franz Joseph of Austria for his hunting prowess. His use of and promotion of the Berger designed guns made them popular for a short period of time and other makers made them as well and some makers called their guns Fürst Pleß Gewehr even though they were not based on Berger’s straight line coil spring driven design. One example is Heinrich Barella of Berlin who made guns both on Berger’s design and also a design which is now referred to as the Daw action. By 1884 the Fürst Pleß guns were considered by some to be “outmoded and impractical”. Click Here to go to the Barella page to see a gun he made on the Berger design and a article from 1868 about what he called his Fürst Pleß Gewehr built on the action we now refer to as the Daw. Below is a side by side shotgun based on Berger’s design. If it is a centerfire gun it would be referred to as a Fürst Pleß Gewehr (Fürst Pless Gun). If it is a needle fire it is not a Fürst pleß gun. The image is courtesy of Joh. springer’s Eben in Vienna, Austria. 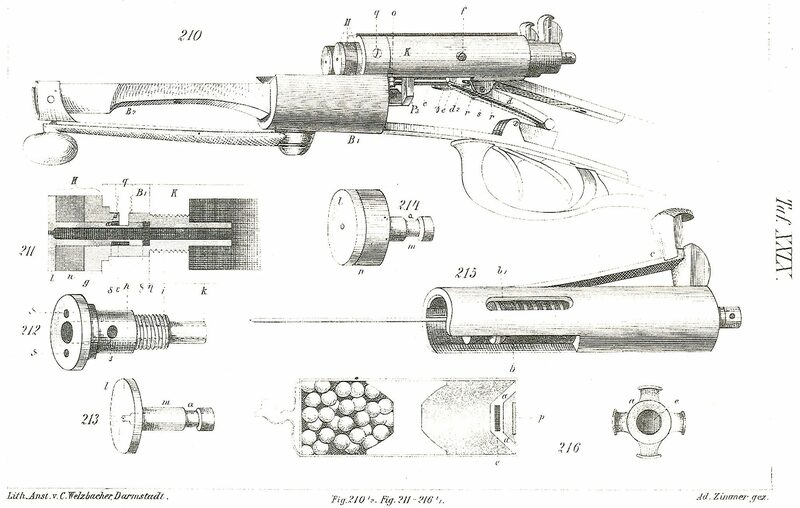 Below is a drawing of the Berger needlefire design which evolved into the centerfire “Fürst Pleß” gun. It is from the 1877 book Die Jagd- Feuergewehre by Adolf Zimmer. 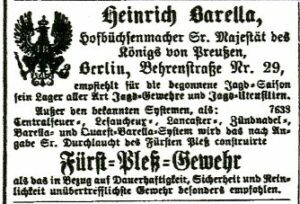 An advertisement for Heinrich Barella and his Fürst Pleß Gewehr (Fürst pless Guns) form the October 1866 Illustrirte Zeitung of Berlin.